We’d been in the country for two weeks and were just now making it to the ancestral homeland. This week was going to be different than the two previous weeks as now there was going to be a bit more visiting people rather than places. And we got a good start to this on Thursday morning. We started with breakfast. I’d been threatening Denny’s since we landed but it had never happened. Didn’t happen this morning, either. Instead we ended up at Blueberry Hill, a family owned Vegas institution of a local diner chain. We walked in, were seated and they immediately came around with the coffee pot. We both put our cups out and drank. When they came back to refill the only half emptied mug, Rasa looked at me. I explained they would keep doing that as long as we sat here and didn’t stop them. “That would never happen in Lithuania” was her only reply. When the food came (Rasa had ordered chocolate chip pancakes with whipped cream) I took one look at her plate and started to giggle. The four pancakes were overflowing a decently sized serving dish and there was near to an entire can of whipped cream on top. Rasa is not a big eater at the best of times and this would have fed a small Hungarian village. I’ll give her credit, she put a pretty good-sized dent into one of the pancakes and ate a fair bit of the cream, but she certainly wouldn’t have gotten dessert for cleaning her plate. From there, a brief drop in at the Amber Unicorn bookstore was required (I’d arranged it to be on our way) to say hit Lou and Myrna (that’s her on the left in the photo), who owned the place. Now, I’ve known them since I was 9 so it’s always felt like home to browse the shelves of their shop. And, like always, we didn’t walk away empty handed. A lot of my shelf space is taken up with Amber Unicorn books. The next stop was my old stomping grounds, the Flora Dungan Humanities Building (FDH) to visit my old professor, Dr. Campbell. It’s always nice to see her as I can trace a good deal of my own teaching style and classroom ideas to her tutelage. 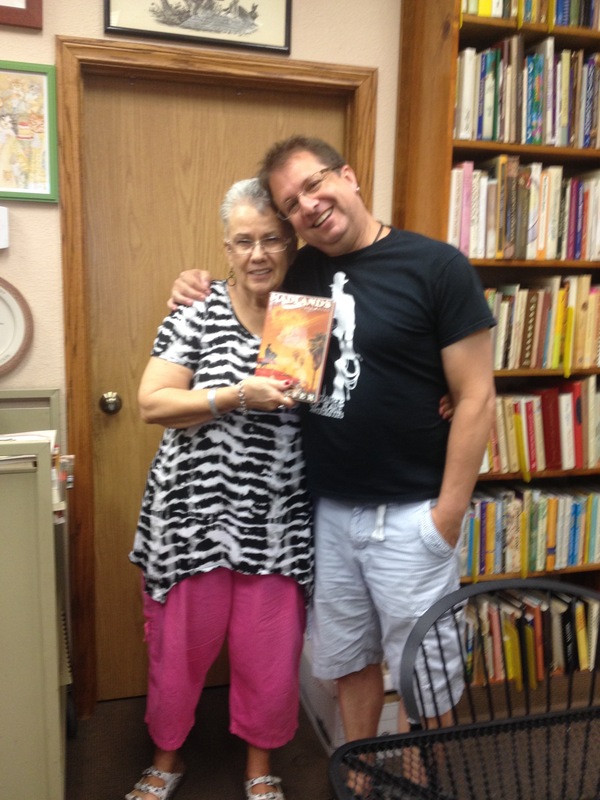 She is a phenomenal professor as well as a great writer and good friend. We talked for a bit, sharing stories of our respective campuses and departments, talked about the state of pop culture and I left with two books to review for the Pop Culture Magazine she edits. From there, the next order of business was, in fact, an order of business. We made our way down to the offices of Stagewrite Publishing, home of Magic Magazine, one of my erstwhile publication benefactors. Whenever I come to town, it’s always a good idea to check in with the bosses to get a little face time, feel them out for a raise and generally make a nuisance of myself. I succeeded beautifully! We had a great chat, Rasa was impressed with a cover portrait of Martin Gardner made from dominoes and we left to go and have drinks with another old friend – Jim. I met Jim when I was getting my MFA and he was getting an MA (he’s since about to finish his own MFA, which is a good thing as he’s a good writer). From the moment we met, Jim and I bonded over old monster movies, pulp science fiction and he introduced me to the genius that is Carl Barks. Interestingly, it was through Jim I met my buddy Chris, who came out for a year to Hungary (while finishing his MFA) and became a travel companion to Croatia. Like I said, this was a more social section of the trip and that evening was going to be one of the big moments. See… my folks were married in August of 1965, during the Watts Riots (according to family legend, a Canadian relative in town for the wedding was amazed at how empty the streets of Los Angeles were as she was expecting a bit more hustle and bustle from the big city). So if you do the math you’ll see that means this year is the Diamond Jubilee, the big 50th anniversary. Since Rasa and I aren’t going to be in the States at the actual anniversary it made sense to celebrate now – and Thursday night was designated. This was going to be a big family celebration including (obviously) mom and dad, Faye and the kids, Pete, Rasa and me. Also included would be Lynn (basically a sister/daughter) and her guy, Dale and my cousin Dana (Dad’s sister’s daughter) and two of her kids, Micheala and Emilee. It was a large group. Sure, Rasa had experienced little pockets of this, but this was the whole shebang all at once. We all met up at Austin’s Steak House at the Texas Station and were seated in our own private room. Rasa and I split the surf and turf and I made her try lobster for the first time. Little side note here about me making Rasa try things. At the Father’s Day brunch she tried crab legs, which were okay. But several of the other things, specifically beverages, which I made her try had met with a resounding “ewwwwww.” This list included root beer and blue icees (seriously, who doesn’t like blue icees?). In the plus column though, was In-n-Out, so I’ll take that as a win. Oh, and the lobster. I think she liked the lobster despite it looking pretty gross. In my family, there’s usually two ways any family dinner ends – and both involve tears. Sometimes those are tears of laughter and sometimes tears of anger and frustration. Thankfully, tonight was the former and there was a LOT of laughter. The food was great, certainly, but the evening was made by the company and the yelling back and forth across the 6 meter table with mom at one end and dad at the other. No matter that it was still a few weeks away, this was the perfect way to celebrate the momentous occasion. Morning was easy followed by lunch with the other boss, Max from David Magazine. I was on my own for this one as Rasa had elected to stay and hang out with mom. As always when we’re able to get together, Max and I enjoyed lunch and chats about everything from the magazine to health, lifestyles, religion and the political state of the US. Usually we have these discussions once a month when I get my monthly assignments (and I look forward to them) but always great to have lunch thrown into the bargain. When I left Max to catch up with Rasa and the folks, they were at Costco. Ostensibly they were there to get a few things but really they just wanted to show off Costco. True to form, Rasa had never seen anything quite like it (face it, no one outside of the US has seen anything quite like it). She was amazed at the sheer bulk of everything there and we had (I say “we” but really it was just me) to stop ourselves from buying several things which were incredibly cool but ultimately weren’t going to fit in our luggage and, frankly, we didn’t need anyway. While shopping I arranged to meet up with my friend Lisa, whom I hadn’t seen in a while, and she had invited our mutual friend David, who I’d been out of contact with for years! We decided to meet up at Caesars Forum Shops and ended up at Carmine’s, an Italian place with an amazing waiter called Michael. The food was “family style” which meant there was enough to feed anyone in that Hungarian village who was still hungry after yesterday’s pancakes. After dinner we kept the conversation going and wandered the shopping mall, looking at the faux Italian decorations and the spiral escalators. We stopped in to art galleries and to look at moving animatronic sculptures and just caught up. It was an absolutely wonderful way to spend the afternoon… especially after dealing with Friday night Strip traffic to get there. After dinner we’d promised my mom we’d stop in after services to say hi to some of her friends. Mom and Dad have been members of this temple for a while. This is also the place Bailey and Riley were both bar/bat mitzvahed and mom is now on the board of directors… so needless to say, they were known. It was nice. We said hi to a bunch of people, I ran into some people I knew and we even met Noah, the son of Faye’s friend Deanne. From there, though, we weren’t quite ready to go home so we did what you have to do when you’re in Vegas…See the lights. We started the tour at the top of Summerlin Parkway so we could catch the entire city spread out before us (we’d see a slightly different view a few nights later) then stopped at the “Welcome to Fabulous Las Vegas” sign before driving the length of The Strip at night. Unlike when we were there a few hours earlier, this time we wanted to drive slowly so we could see everything. Rasa took lots of pictures out the window and we eventually made it home a bit after midnight. My sister has a couple of annual traditions. 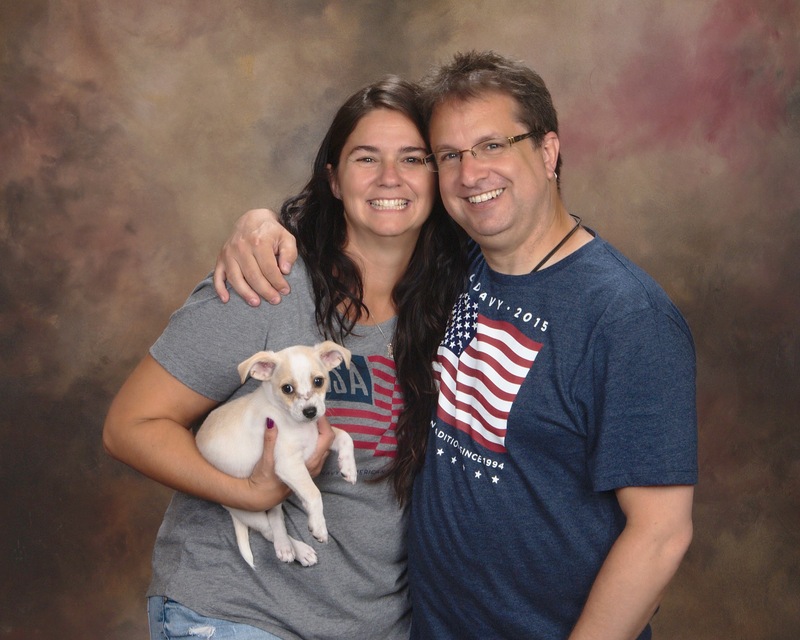 She loves the planning and execution of Black Friday shopping and she insists on getting the yearly Old Navy flag shirts and having 4th of July pictures taken. 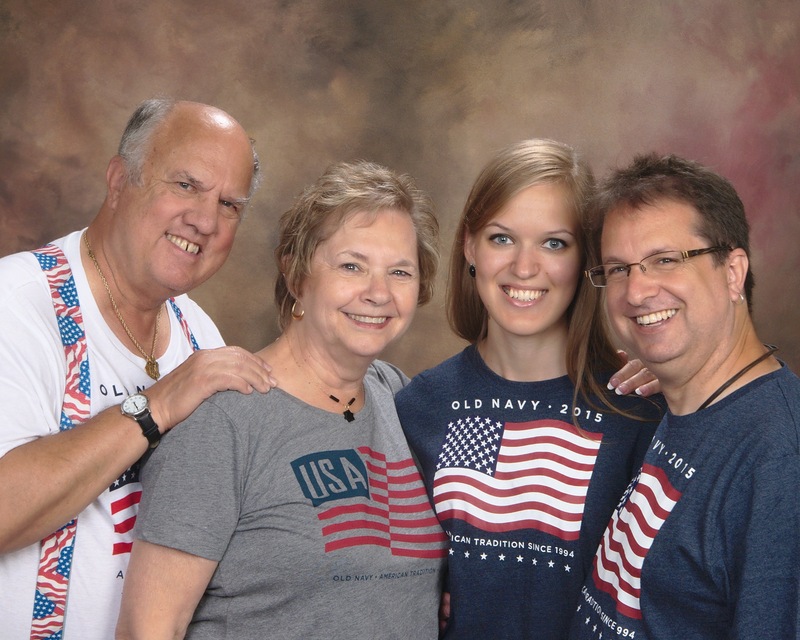 This year, knowing we’d be there for Independence Day, we had pre-ordered shirts with her and were ready to take part in the family photo parade. The group which showed up at 11 on Saturday morning were the same bunch who were at dinner on Thursday night (with the one addition of Echo, Faye’s new puppy). The laughs continued and we all had a good time, spending about an hour getting some fun shots. 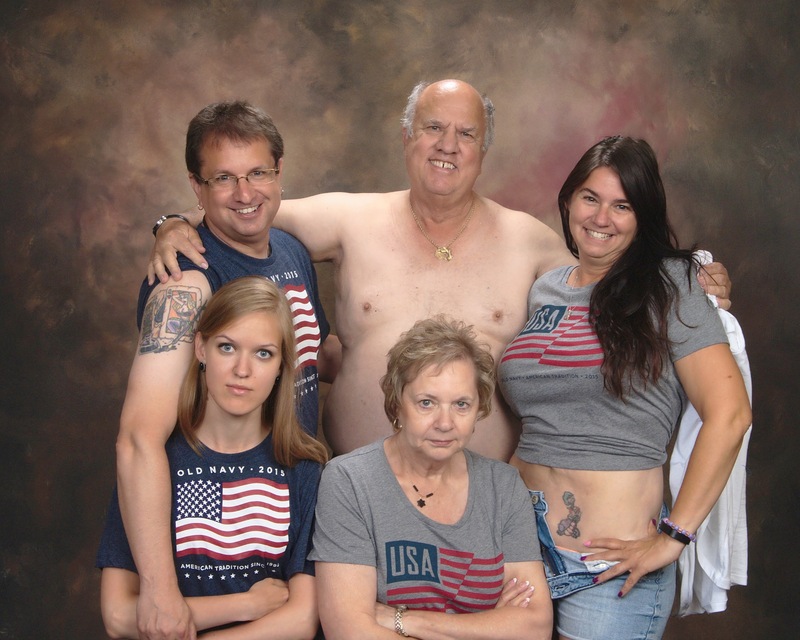 My favorite is the latest iteration in the now almost 20 year old original photo of the family showing off their scars and body markings while mom looks out, disapprovingly. We’ve recreated it once before, about 6 years ago and now we’ve done it again. I’d say Rasa definitely fits in well. Once pictures were done, Bailey came back to the folk’s place with us so I could spend some time going through boxes in the storage shed. This is my “stuff,” constantly referenced in the phrase “someplace in a box in Vegas…” but the truth is I don’t know exactly what I have and where. So part of this trip was to go through some boxes and at least get an idea. At some point these things will all make it to wherever we have a permanent home but for now, it sits. One of the things I found, which was a great relief to me, was the remains of my comic collection. Two boxes full of the issues I collected as a child, including my complete run of the Johnny Blaze Ghost Rider. This collection was one of the first things I ever completed in my life and for that, if for no other reason, it holds a special place. But also, Ghost Rider #35 is the first comic I can remember buying on my own (at Readmore bookstore in the shopping center at Spring Mountain and Jones) thereby inspiring my love of comics to this day. If that weren’t enough, I’m pretty sure Johnny Blaze as a character has had a tremendous amount of influence over my own creative life (not to mention my love of motorcycling). So yeah, it was nice to know those books hadn’t been lost somewhere along the way. I also set aside a significant number of books to be donated/sold/traded in at some point. It was cathartic and fun hanging out with Bailey while he helped. Washing off from the exertion in the 110 degree temperatures, we then headed out to Faye’s for a 4th of July BBQ where we got to see more of mom and dad’s friends as well as more of Faye’s friends. Bailey was the grillmaster and made some excellent burgers and dogs while Riley and Jessie and their friends played in the pool and the rest of us all just visited. As it started to get dark, Rasa and I took our leave. We had been told about a party a friend of a friend was having and by the sound of it, a number of my friends would be there so it seemed like a good opportunity to see a bunch of people at once. On our way across town, we actually got a great overview of the whole city and all the fireworks going off. We drove past a bunch of turnouts where people had parked their cars, hoisted kids onto the roofs and watched for a a good half hour as gunpowder and chemicals produced a beautiful cacophony in the already bright sky. The party itself was kinda of interesting. Last time I was in town I’d also been invited to a party and when I showed up, it was a bunch of my friends and I knew almost everyone there. This time, though, not so much. When we walked up the driveway, there was a group hanging out smoking and we asked if this was “Eric’s place.” They didn’t know. We risked it and walked in, past the sign warning us we might be filmed for a TV show, and in the backyard we were astonished by the sheer size of the spectacle. Sure enough, we soon saw some friends (Jill and Nathan) who were in line for food. They directed us to where “our” friends were (in a back corner) and yes, the party accomplished what I had hoped it would – I got to see a number of people I wanted to see on this trip, introduced Rasa around and even accomplished a goal of snagging an autograph of my friend Jonathan for my friend Jennifer who is a big fan. Sunday morning is normally a day of rest, and for Rasa it was. She stayed home while I went out. When I posted on Facebook that I was going to be in town, several people obviously reached out, some of whim I’ve already mentioned. But then there was Bill. Bill and I went to high school together and I literally hadn’t seen him in 30 years. Even in high school we weren’t great friends, but certainly knew each other. Of course, thanks to the wonders of technology, where I can have video phone calls with people living across the world, not having seen someone in 30 years is far from an impediment to getting to know them again. So after playing a bunch of phone tag, Bill and I settle on meeting at a Starbucks at 11am. I figured we’d have coffee, catch up for an hour or so and then move on. 3 hours after we sat down, we both had to force ourselves to leave due to other commitments. 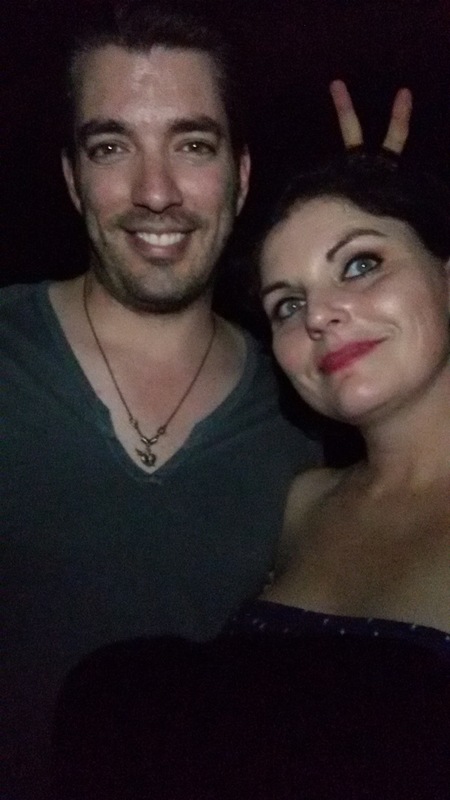 It was great catching up with him, but even more so, getting to know him now and making a new friends rather than trying to be the “friends” we were in high school. The reason I had to leave was because dad (and mom) had offered to take Rasa to Redrocks and I wanted to go along. So again, the four of us piled into the car and we went to look at the beautiful nature closest to Vegas. For Rasa, the nature is what impressed her the most about the States. 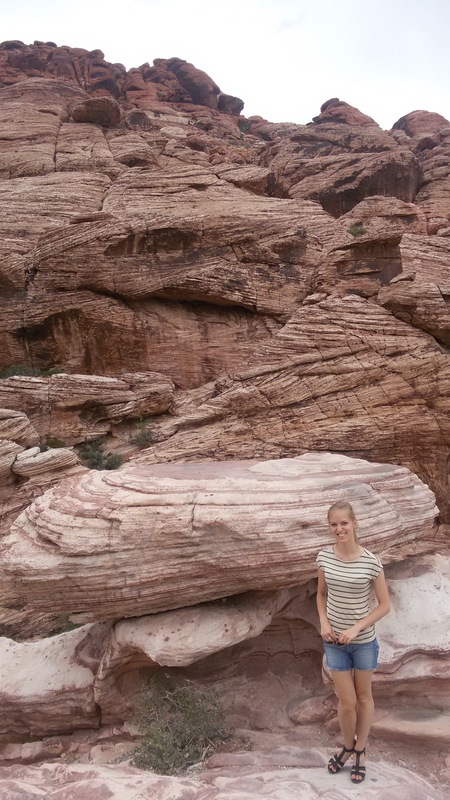 She was blown away by the colors and rock formations and again, the sheer size of it all. We stopped several times to get out and hike around a bit, take pictures and eventually completed the Blue Diamond loop which took us back into Vegas where dinner with Nancy and Irv (friends of the folks) awaited us. After dinner we had an appointment to meet Vic and Kim, two of my favorite people on the planet. When I was living in Vegas, these two (and their family) were very often my lifeline. Kim was a confidant and co-conspirator (and the trip we took to Disneyland is still classified under the same security as the Kennedy files). So tonight I was going to get to introduce them to Rasa and then we were all going to see another friend, Kevin, in his show, Defending the Caveman. The evening was perfect. We talked, we shared, we laughed, we had pecan pie at Binions with Kevin after the show. 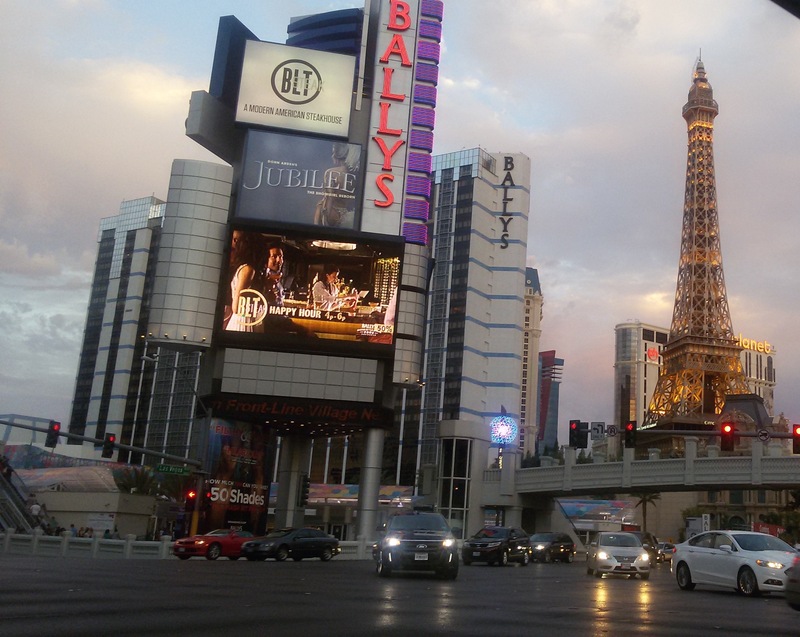 Another great day in Vegas which was ending way too late. Especially since we had to get up very early the next morning (and I wouldn’t have traded it for anything in the world). Our last full day in Vegas started for us at 6am or so. We had decided to do something I wanted to do this time. Something I’d never done in all my time living in Vegas. 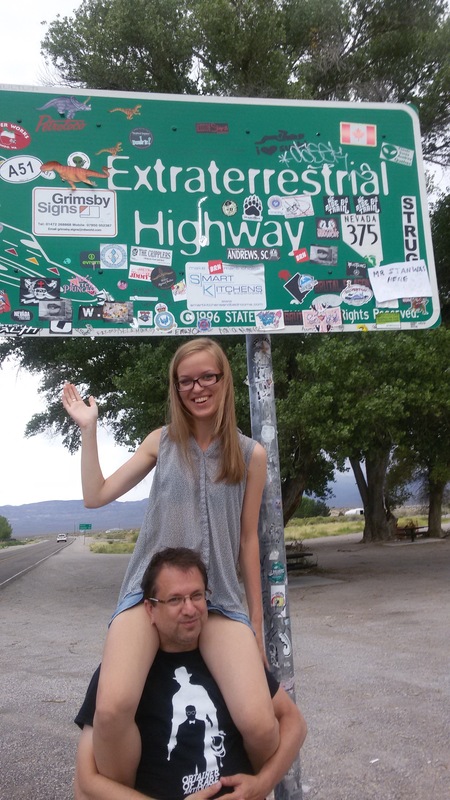 We were going to visit Area 51. And again, we were going to go with the folks. Now, we had discussed with them the idea of getting an early start, on the road around 7 or so. 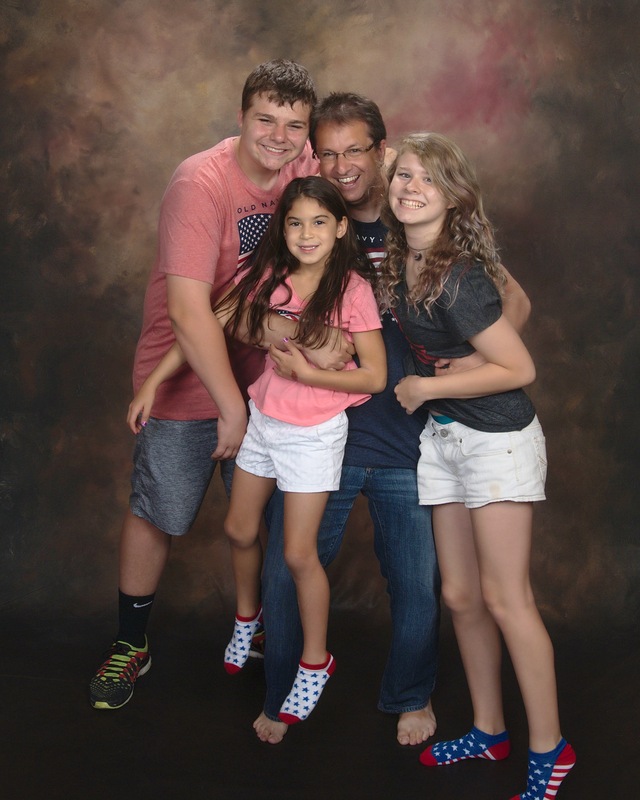 Naturally, we got up at 6 and groggily took our showers and were ready at the appointed time… but there was no movement from the rest of the house. I knocked on the door to their bedroom several times before we finally got a very tired answer. It seems that since we hadn’t been home when they went to bed after midnight, they assumed we weren’t going to be ready come 7am. Little do they know how we travel! So it was with just a bit of a late start we got on the road, eventually making our way to The Extraterrestrial Highway and up to Rachel where we stopped and had lunch at the Little A’le’Inn. Naturally, they were all set up for the Alien hunters, with a wrecked saucer on the back of a tow truck parked in front and maps of how to get to the front and back gates of the restricted facility for sale, cheap. We even went to the back gate and took some picture (while assuming we were being monitored on video surveillance systems beamed to some remote, possibly alien, viewing location). There was also a dead and decaying camel just off the side of the road, but the less said about that, the better. On our way home, we stopped at Faye’s place for another photo shoot. See, in order to come out with me, Rasa had to miss her graduation ceremony and so didn’t get the chance to walk across the stage and get her diploma. 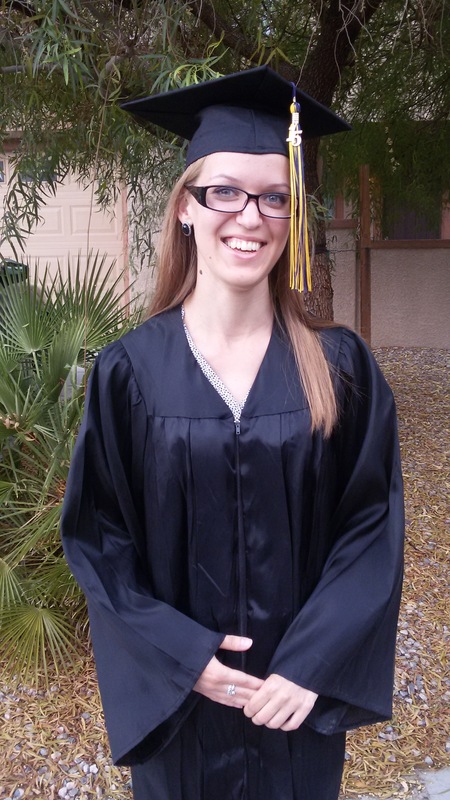 This means she also didn’t get the chance to have silly photos take on her in a cap and gown. We solved that problem. While cleaning out the storage shed I found my old cap and gown and Faye had a friend who had a tassel with “’15” on it so we gowned her up, put mom’s iPad case in her hands to simulate a diploma cover, and, voila, instant graduation pictures! 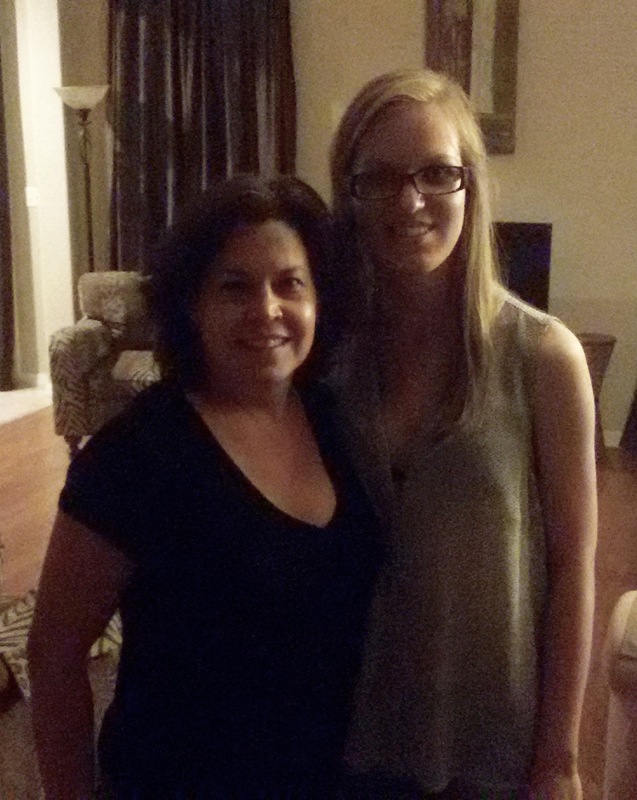 The evening, our last in town, was spent having home cooked fajitas with Lynetta and Lisa. Lynetta is the creative mind behind Fabric Manipulation (everything you need sewn for a magic act) as well as a wonderful magician in her own right (and not only is she a friend, but I had just done an article on her which was in the June issue of Magic, so that was cool) and Lisa is a musician web guru – two more talented people you’d be hard pressed to find. And Lynetta can cook! Dinner was delicious, conversation was great and again, we were quite late coming home. I had some work to take care of in the morning, so I did that while Rasa packed and made sure everything fit and was evenly distributed, weight wise. We said good-bye to the folks (returned our garage door opener) and headed out for two last meet-ups. The first was Dayvid, another old friend, writer, lawyer and part-time judge. We were able to meet up with him for a coffee at a swanky new place downtown and he took us to a great record shop, 11th Street Records (with actual, honest to goodness records) and an incredibly cool, community-oriented bookstore, The Writer’s Block. It was really great to see him and to catch up with what he’s been doing. Our last stop, before heading out of town was coffee with Grndl, THE Vegas street magician. In addition to sharing a love of magic, we also share a love of geekiness and science fiction so it was great we could get together before we left town. Our drive back to LA was mostly uneventful, except for trying to find Jennifer’s place to drop off the autograph we’d gotten a few nights previous. I knew she lived out but never realized how far. It was an adventure, not because it was hard to find, but because every time I thought we were getting close, there was another turn or long stretch of road. No matter, it was nice to be able to deliver the gift, especially since she hadn’t been feeling well. After that, though, it was a straight shot into the city (except for the one time I ignored the GPS and we got stuck in a huge traffic jam) where we slept for a few hours before getting up at 4am to head out to the airport and return the car so we could make it on time for the first of our three flights that day. 20 hours worth of flying and airports once again left us in Warsaw, Poland, where we now had another 12 hours or so to wait for our bus to take us back to Kaunas. We filled the time by wandering the city center, then taking a hop-on hop-off bus tour, which we ended up hopping off and not hopping back on again in old town. After a long walk around the area, where we saw the rooftop gardens of the university library, we ended up joining a free walking tour which focused on the holocaust and the Warsaw Ghetto in particular. We saw where the old ghetto walls once stood and heard stories of cursed land and famous Jews. The tour ended at Polin, the Museum of the History of Polish Jews. From there, we were starting feel the strain of travel so we headed back to the central station (which is right next to a huge mall) and wandered, shopped, and drank coffee until it was time to meet our bus (which turned out to be almost an hour late). 6am on the 10th of July, we finally made it back home, where we slept and then attempted to get back into the every day living of our lives. You know, if you just go to Captainjaq.com they’re all there… But okay.